The Obama administration implied Tuesday that it will not act to block a new deal between Egypt and Russia to build nuclear reactors in the Middle Eastern country. Egyptian President Abdel Fattah al-Sisi announced early Tuesday that his government had inked a memorandum of understanding with Moscow to jointly construct Egypt’s first nuclear plant, according to multiple reports. 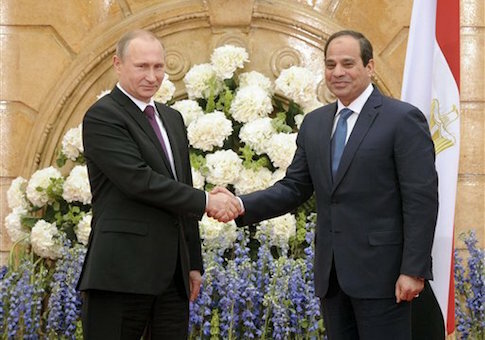 The deal was announced following a meeting between al-Sisi and Russian President Vladimir Putin, who was in Cairo for meetings about boosting ties between the two nations, particularly on the security front. The high-level meeting between the two leaders comes as U.S. relations with both countries continue to cool. Egypt has increasingly relied on Russia for military and security hardware since the Obama administration scaled back its historic cooperation following the ousting of the Muslim Brotherhood’s Mohamed Morsi. The nuclear announcement also comes just weeks after Russia agreed to help Iran build several new nuclear reactors. When asked by reporters on Tuesday to comment about the new deal between Cairo and Moscow, State Department Spokesperson Jennifer Psaki said that the United States supports the peaceful pursuit of nuclear power. "We’ve seen reports that the government of Egypt has signed a [memorandum of understanding] about nuclear power," Psaki said. "I don’t have more details about that. My understanding is that has been something under discussion for some time." "We support peaceful nuclear power programs as long as obligations under the Nuclear Nonproliferation Treaty [NPT], to which Egypt is a signatory, and obligations to the [International Atomic Energy Agency] are fully met and the highest international standards regulating security, nonproliferation, export controls, and physical security are strictly followed," Psaki said. The Obama administration, she said, will not oppose the nuclear agreement between Egypt and Russia. "We don’t have concerns about what we know to date about this [deal]," she said. Putin and al-Sisi announced the nuclear pact during a joint press conference in Cairo and said the goal is to "help Egypt reach its energy needs," according to reports. Trade between Russia and Egypt grew to around $4.5 billion last year, constituting more than an 80 percent increase, according to comments by Putin reported on the Middle East Eye news website. Russia and Egypt inked a massive $2 billion arms deal in late December that promised to provide Cairo with attack planes, air defense, and anti-tank missiles. Putin told Egyptian media that the two countries are examining ways to stop using the U.S. dollar when conducting trades. "This measure will open up new prospects for trade and investment cooperation between our countries, reduce its dependence on the current trends in the world markets," Putin told Egypt’s al-Ahram newspaper in an interview. The Egyptian Embassy did not respond to multiple requests for comment about the nuclear deal and State Department’s reaction. Meanwhile, Moscow continues to ink similar arms and nuclear deals with countries such an Iran, where Russia recently promised to also build new nuclear reactors. This news was met with similar approval from the State Department, which told the Washington Free Beacon at the time "the construction of light water nuclear reactors is not prohibited by U.N. Security Council resolutions, nor does it violate" previous agreements signed by Tehran. In the last months, Tehran and Moscow also signed a new arms deal to provide the Iranians with advanced missile systems and stealth submarines, among other weapons. Anna Borshchevskaya, an adjunct fellow with the Washington Institute for Near East Policy (WINEP), said the nuclear deal with Egypt is a sign that Russia is seeking to fill a vacuum left in the region by the United States. "What we’ve seen is that as soon as the U.S. withdrew support for Egypt … this opened an opportunity for Putin to move in an push his own agenda, which is an anti-Western agenda, to gain influence for himself in Egypt," Borshchevskaya said. "At least on a symbolic level, this represents that we continue to ignore Egypt’s interests and security concerns," she said. "It opens the door for other anti-Western players to gain influence in Egypt." As the United States penalizes Russia over its military action in Ukraine, the Obama administration is signaling it is fine with Moscow taking the lead in the Middle East, Borshchevskaya explained. "It speaks again to how ambiguous we are," she said. "We don’t speak with a clear voice and it’s a consistent pattern that we’ve been inconsistent, both on Russia and the Middle East." "There’s a certain kind of respect for someone who sticks to their guns and when we don’t do that it becomes an issue of credibility." This entry was posted in National Security and tagged Abdel Fattah al-Sisi, Egypt, Russia, Vladimir Putin. Bookmark the permalink.